The Fraunhofer Institute for Photonic Microsystems (IPMS) and Korea's Renetec will jointly build an OLED lighting fab in Gwangju, South Korea. The project will cost around €140 million, and the Fraunhofer will apparently invest up to 25% of that sum (€35 million). We don't have any more details at this time. 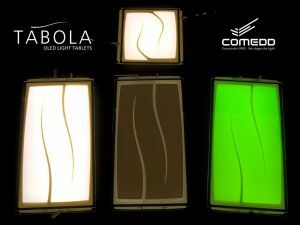 Back in October 2010 the Fraunhofer IPMS Institute unveiled new OLED lighting panels called TABOLA (the full name is TABOLA OLED Light Tablets), set to be fabricated at COMEDD and released in Q1 2011 (which didn't happen yet). Perhaps these panels will be produced in the new plant - although it will probably take quite a while to finish the plant so they may develop newer and better panels by then.